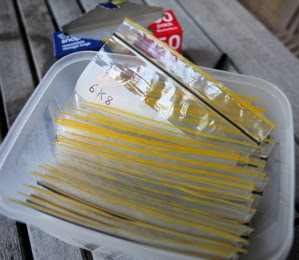 I had a plastic box full of resistors collected over the years. When building some project, one of the hardest things for me is finding the right components in that jumbled mass. In the past I've tried tackle boxes with lots of drawers, but there's never enough for all the different resistors and they often need their leads bent to fit. Found a great thread on slashdot on this topic where someone suggests this method. I bought a bunch of 15cm x 9cm snaplock bags and a box that fits them nicely. Spent some time sorting out the collection (only resistors done so far, capacitors are next). The plastic bags have a nice place to write the values on them and all. This system is very compact and if you get a value to file that fits between two others it can be simply inserted without the need to move all the drawers. The point has been made that this probably isn't a good idea for static-sensitive components, but I just thought I'd put them in the bag inside their anti-static bag or foam pad. No doubt this whole exercise is really just elaborate procrastination.